Although sometimes I can’t resist writing about great architecture like that of Lincoln Cathedral, this blog usually focuses on more ordinary buildings. So, much as I enjoy ornate ecclesiastical spaces, grand country house vistas, and great art on the walls, I’m often to be found squinting hopefully up back streets and poking about in small parish churches. It’s my view that such unregarded places and spaces often have something for all of us to enjoy, and I like sharing my enjoyment. This capital, which is just about the first thing you see when you open the door of St Mary’s, Ludgershall, seemed to sum up such ideas of sharing and togetherness. The church dates mostly from the 14th and 15th centuries, and in a 14th-century church in a remote village, you’d normally expect simple octagonal pillars (as we have here) with fairly plain moulded capitals. But on this capital and two others (one a close cousin to this but without the linking arms, another showing just heads) a local mason has gone for something more adventurous. We’re not looking at the work of a master carver here but that’s not the point. 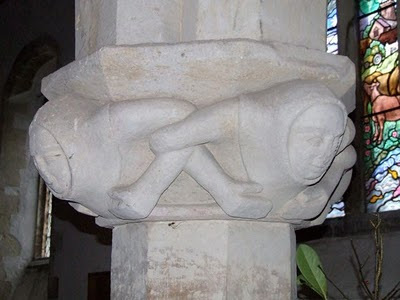 It was enough that whoever carved this capital (and perhaps some similar ones across the border in Oxfordshire, which I hope to find soon) could make people smile. And perhaps suggest some symbolism too. What does it say? The church (or the people) united? Auld lang syne? Anachronistically, I just think of it as All together now. On the lumpy common above the village of Brill stands this windmill, apparently built towards the end of the 17th century and one of the oldest survivors of its type. It’s a post mill, which means that the structure is supported on an upright post, which is designed to allow the whole of the main part of the mill to be turned so that the sails face the wind. The post is concealed in the brick structure, the roundhouse, which forms the lower part of the mill. Everything above that – the wooden shed-like structure (called the buck) and the nine-metre-long sails attached to it – originally turned with the aid of the pole that sticks out to the right of the picture. 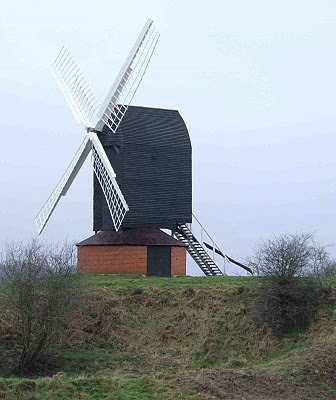 The mill at Brill ran until 1923, by which time motorized mills could grind wheat and barley much more cheaply and quickly than windmills. According to the Brill village website, when Albert Nixey, the last miller, stopped work, he was only the sixth recorded miller since the mill was built in around 1685. That means each one must have put in an average of 40 years service. Recently the mill has been lovingly restored, so the roundhouse, wooden-clad buck, and sails are all looking good. The complex mechanism of hand-made wooden gears and shafts inside has been overhauled, too, so that another generation can appreciate how grain was once turned into flour by in the mill at Brill on the hill. 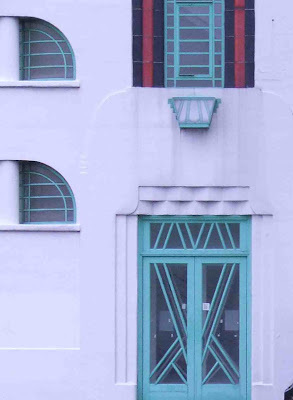 As a final footnote to my Art Deco encounters on London’s Western Avenue, here’s a detail of the building just across the adjacent road junction from the Hoover Factory. It’s a bank and row of shops, clad in this white and green tile and probably put up around the same time as the factory. No doubt the original shops were used by the Hoover workers as well as by the residents of the many new houses built in this area at around this time. Here we have the vocabulary of Art Deco, the green and white colour scheme, the white cladding, the little bursts of ornament – plus some eccentric extras like the unusual window frames, which are a far cry from the sleek metal-framed windows of the Hoover Factory. It’s all used to much more modest ends, a small tribute to the monster factory nearby showing how this kind of decoration can work on a smaller scale. It’s easy to miss in the shadow of its neighbour, but satisfying to find. To the west of the main Hoover Factory in Perivale (see previous post) is the canteen block, which was added in 1938. Although it shares the white and green colour scheme of the main façade, the canteen is rather different. It’s a steel-framed building, and the load-bearing structure of metal uprights and girders is on the inside, which means that the outside can be covered with bands of windows, right up to the corners. The details are still strongly Art Deco. The mixture of sharp angles and curves, the flashes of colour, the nautical railings to the balcony, the mouldings, the clock without numerals – all these features are typical of the style, which is a heightened, large-scale version found in streets of 1930s houses off the North Circular Road. The light interiors must have been pleasant spaces in which to eat and relax. Strip windows, white walls, and a steel frame structure – these are features of buildings in the international modern style that many architects and writers in the years before and after World War II thought was the best way to build. But these structures for the Hoover Company, with their added ornament and strong decorative forms are a far cry from the pared-down simplicity of the international style. Nikolaus Pevsner in his 1951 Buildings of England volume on outer London, could not stomach the industrial Art Deco of the Hoover Factory. He wanted factories to be plain and functional, with international modern facades that were in keeping with the utilitarian production floors behind them; such buildings were viewed as honest. Art Deco structures like the Hoover Factory, on the other hand, were seen as dishonestly hiding their functional heart behind a tawdry frontage. ‘Perhaps the most offensive of the modernistic atrocities along this road of typical bypass factories,’ thundered Pevsner about the Hoover Factory, giving succour to developers who wanted to knock such structures down. Well, the present is another country, and we see things differently here. Indeed by 1991, when the relevant expanded Pevsner volume, London 3: North West, came out, the new writer, Bridget Cherry, revised this judgement, finding much to admire. It’s sad that Pevsner’s original words were seized upon by developers who wanted an excuse to pull down factories like this, but good that Art Deco buildings now have well informed supporters. London is the richer for the survival of such buildings. When I visit London my route in and out of the capital city takes me past the former Hoover Factory in Perivale, and seeing its long pale façade on the way out, I know that I’ll soon be beyond the urban sprawl and on to the M40. 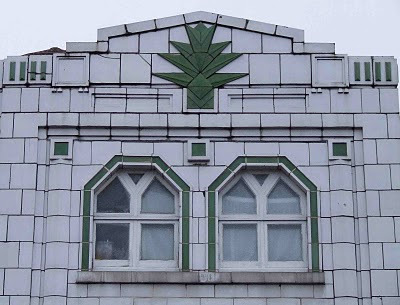 For thousands of others every day, this great flash of white and green represents their farewell to London, and no doubt when the factory, designed by Wallis, Gilbert & Partners, opened in 1933 it was designed to make just such an impression. 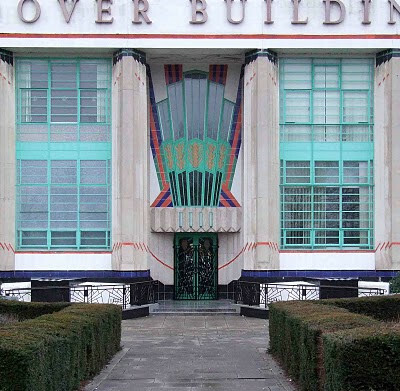 The Hoover Factory was one of many built on the western fringes of London in the Art Deco style. From the road, we see the office section, but behind stretched a huge manufacturing building – eventually extended to about a quarter of a million square feet – where some 1,600 people assembled the vacuum cleaners that were already synonymous with the company’s name. For Hoover, manufacturers of the latest cleaning devices, this factory was a perfect symbol. Its white walls suggested cleanliness and hygiene; its flashes of coloured decoration implied that the company's products were stylishly designed; its big windows created light, airy spaces inside, showing that modern workers could work in modern comfort. Gliding past along Western Avenue, one takes all this in, but stop and look at the details and it gets even better: the great cinematic sweep of the window above the entrance; the artful arrangement of diagonal glazing bars in the doors (mirrored incidentally in the patterns of the iron railings around the site); jazzy light fittings; white sculpted variations in the wall surface; amazing recessed quadrant windows in the stair towers. For a while, buildings like this were unappreciated. They were seen as ephemeral cinema-style architecture, their flashy decoration out of kilter with the puritanical tenets of modernism. And so, one by one, as manufacturing moved away from London, they were demolished. Hoover shifted their manufacturing away from London in the 1980s, and their building looked likely to suffer a similar fate. But by this time, more people came to see the virtues of buildings like the Hoover. The decorative flair, and sometimes excess, of postmodern architecture helped many see them in a new light. Architects and public alike realised that cinema-style building was not all bad (I once heard a well known postmodernist modestly refer to some of his own work as ‘B-Movie architecture’). 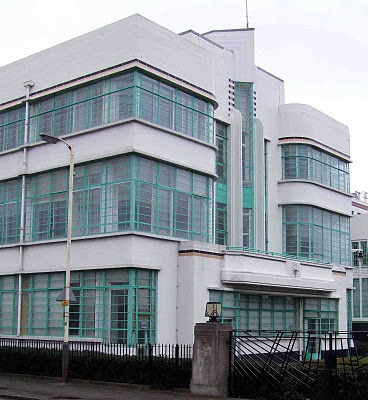 So the Hoover Factory was saved, although it’s now the called Hoover Building, because nothing is manufactured here and it is occupied by offices and a supermarket. For which I for one am grateful, as I drive westwards, dodging speed cameras and dashing objects, and saying my farewell to London. In the Abbey Gardens by the river in Shrewsbury is an interesting rockery, made up largely of tantalizing fragments of old buildings. This very special rubble got here because the land was once a stone yard of belonging to a local family of builders, sculptors, and architects, the Carlines. The place is easy to miss as you hot-foot it across the river on the way to the abbey, but it’s well worth a pause. 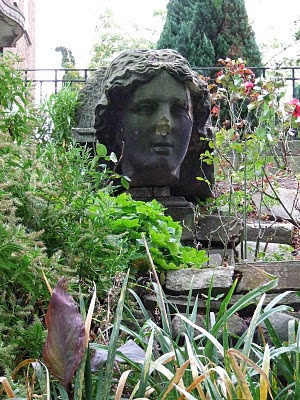 The collection includes various statues, a carved stone head, part of an Ionic capital, a clock face, a coat of arms, and other fragments of moulding and carved stone. Presumably they came from altered or demolished buildings, and most of them must have found their way here in the 19th century. For the most part, it’s not known which buildings these carvings came from. 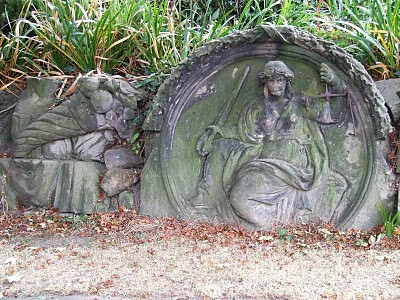 The main exceptions are the fragment of Ionic capital and the figure of Justice, shown with her scales and accompanied by ears of wheat, a cornucopia, and the Shropshire coat of arms. These came from the town’s old Shirehall, a building designed by a local man, Hiram Haycock, and demolished in 1834. Justice has seen better days. Her surface is flaking and only part of her iron scales survives – they’re vulnerable in this position. And yet I like the way these stones have been unselfconsciously preserved by being incorporated into a rockery, finding a use that would have surprised their creators but must have given pleasure to locals and visitors alike. I’ve never fancied a rockery of my own, but if it could be like this I might change my mind. I’m not exactly snow-bound, but the weather and the need to catch up with work after New Year mean I’m not going far in search of buildings right now. So here’s a building in a local town that I particularly like. Cirencester is one of the essential towns of England. 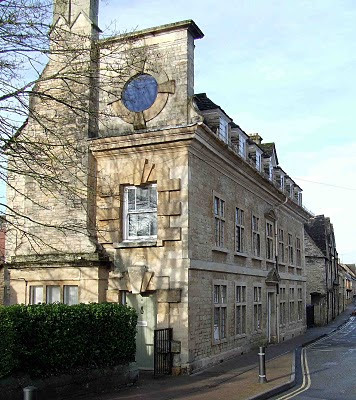 Its many old buildings in creamy limestone, its winding streets, its Roman remains, its vast medieval church, its adjoining great house and park (the park hospitably open to the public), add up not only to the essence of a Cotswold town but to the essence of many periods of English history. There is so much here that the place could sustain a buildings blog of its own. Although it’s a Roman town, and the Romans loved straight lines, Cirencester’s streets curve continuously, opening up and closing vistas as one moves along them, object lessons in townscape, each bend bringing visual and historical surprises. This building is sited where a road bends and meets another, so if you are driving past and not dodging other dashing objects, you are hit between the eyes by this extraordinary end wall. And the doorway and widow, with their larger-than-life surrounds of stone blocks (exaggerated Gibbs surrounds in archispeak), not to mention that roundel at the top, are guaranteed to grab the eye. It’s Powell’s School, originally the Yellow School, opened in 1740 and named in honour of its founder, Mrs Rebecca Powell. No doubt the roundel originally bore and inscription to tell us as much. It’s on this narrow end wall because this is where most passers-by would see it, although the main façade, on the quieter road, is handsome too. In the mid-18th century when this building went up, there were no state schools, only independent foundations like this one. They are sometimes understated pieces of architecture, but occasionally had a grandeur, like this one, that both commemorated the founder and, one hopes, inspired the pupils. Schools are important enough to be given decent buildings, it seems to say. Here’s to that. In a comment on the previous post, a reader expressed appreciation for the way I describe things, saying that where she would have seen a stained-glass window showing the Holy Family and the Magi, I picked out a host of details, enhancing her enjoyment of the image. This is not the first comment I've had along these lines, and it pleased me greatly because it gets to the heart of what this blog is about - I point out some of the things I see in buildings, including details that others might miss, in the hope that my readers will be interested too. One of the reasons I do this is because I'm all too aware that buildings - the biggest objects, on the whole, that humankind creates - are oddly easy to ignore. We might be awestruck by a great cathedral or annoyed by an ugly office block, but most people, most of the time, pay scant attention to the buildings around them. Rushing around from place to place, few of us take the time to look at the buildings we pass. And when we do, how much do we actually take in? Most of us are like the gallery-goers who spend on average just a few seconds in front of each painting, identifying artist and subject but missing all but the most obvious details. I'm remdinded of my experience of working for the publishers Dorliong Kindersley in the 1980s. Peter Kindersley was very aware of how little time people spend looking at images, and this was an issue of huge importance for a publisher of illustrated books. 'We need to slow down the pictures,' he would say. And so we adopted a variety of methods to make people look more closely at the pictures in our books - placing text right next to the part of the picture it was describing, using leader lines to point to specific parts of an image, commissioning cutaway illustrations, photographing an object from several different angles, and adding all this together to create complex pages in which words and pictures were integrated. In this blog I try to slow down the buildings around us and showcase unregarded structures or unfamiliar aspects of well known ones. In so doing I hope to sharpen my eyes, to make myself more aware of telling details and neglected bits of the built environment. I hope to help others see more clearly too - though they may well see different things in the buildings I write about. The main thing that you need when looking at buildings, said John Betjeman, is not a guide book, or a theory, or a degree in art history, but 'an eye'. Everyone's eye is different. The important thing is to use it.